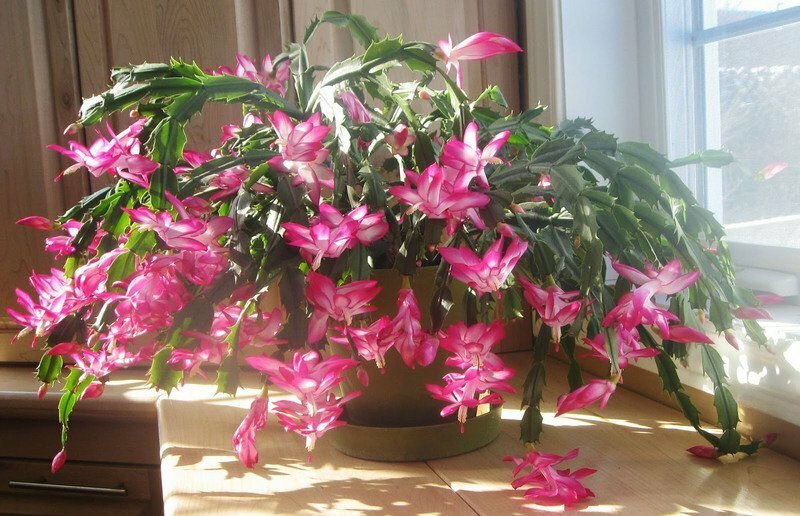 Every year about this time of the season I get calls and inquiries about care for Christmas cactus — where to place them; do they prefer warm or cool; will they thrive in direct sunlight; do they need repotting; do I fertilize it; and what happened to it? Christmas cactus is one of the most admired plants around this time of year because of the anticipation of what is to come when it finally blooms. If you have one, have seen one or have always wanted one, then you know why there is satisfaction when they bloom. They are the seasonal plant that always pleases, or at least most always does if you know how to encourage them to bloom. They can bloom again in March and April if they are left to rest by subduing them with light restriction for six to eight weeks and then returning them to light. Water should be limited during this resting process and begun again once returned to the light. Too much moisture may cause what is known as “bud-drop,” so be careful and water only when the top inch of soil is dry when checked. While Christmas cactus is often thought of as a desert plant, quite the opposite is true. It is actually a tropical plant and prefers humidity. A good way to achieve a steady amount of moisture and humidity is to plant it in a container with a hole for drainage) and place the pot on a bed of pebbles/stones in a shallow tray that can hold a satisfactory amount (half filled) of water to hydrate it. This will provide humidity, but never overwater them because too much water will do more harm than underwatering and possibly cause buds to drop off. Some people are just lucky enough to have them bloom profusely without much thought, simply because they have perfect conditions or have enough knowledge about them and the care for them to force the blooming process. Others are not so fortunate however, because they know little about them. I haven’t had a Christmas cactus for years, but when I did I apparently was lucky enough to have done everything correctly to get it to bloom at the Christmas season. I had an east-facing room with a front porch that provided perfect light. An east or north-facing room suits them better than a west or south-facing room and indirect, bright light is perfect. Too much direct sun can burn the leaves and drafts, heat vents and fireplaces will dry them and hinder their growth. Normal room temperatures of 65 to 75 degrees are perfect for blooming. When they are put away for a resting sequence in subdued light, they should be kept cool in 50-55 degree temperatures. Fertilize them with a general plant fertilizer, like 20-20-20, two to three times per year. But stop fertilizing before the buds appear, which is by the end of October. You may place them outside in the garden during summer months, but keep them out of direct sunlight, preferably in a filtered light area where temperatures stay around 75 degrees. To get them to bloom during the holiday season, the key is proper light and correct temperatures. In other words, place them in a cool area at night, bring them out to warm during the day and limit the watering.